Congratulations to Harry Mowl and Jacob Stark for an outstanding performance in the Final of the HHDUGC Junior Foursomes at Meltham on Sunday. The final is a 36 hole matchplay event with Harry and Jacob holding a two up lead after 18 holes. The Crosland Heath pairing of Sam McDonald and Oliver Bingham were revitalised after lunch and rushed into a 3 hole lead. 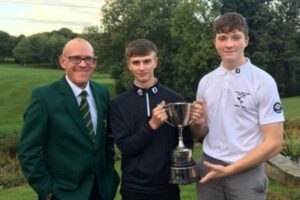 Harry a Jacob rallied and with three holes to play found themselves 2 down but a strong finish helped them recover the lead and run out winners by 1 up margin. © 2019 Crow Nest Golf Club All Rights Reserved.